In my novel, the protagonist and her boyfriend (for now, I’ll call them by les pronoms français, Elle and Il*) exchange a lot of letters. Elle has to wait weeks before she receives her first letter from Il — even though he writes to her the day she leaves the U.S. for France, his letter takes that long to arrive. She answers it, but the two don’t wait for the next letter from the other in order to write. In fact, during the year, Il writes to Elle at least once a week, and she writes to him almost as often. They talk on the telephone less than once a month, because phone calls are very expensive, and difficult to make. Neither Elle nor Il could imagine writing letters (emails), texts, tweets or updates (let alone posting photos) that the other would be able to view immediately. And if they were able to Skype or Facetime, I dare say their story might have turned out quite a bit differently. Might have. But they don’t even imagine doing those things. 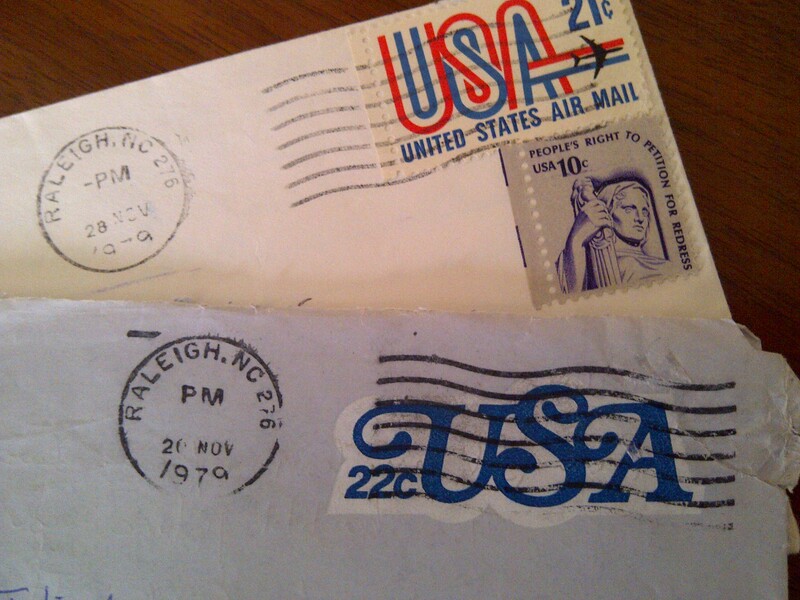 The fact that their handwritten letters have to travel over an ocean by U.S. airmail makes each piece of mail from the other treasured and special. That’s why Elle, at least, keeps all of Il’s letters. That, and also because Elle is the more sentimental. The fact is (or, the story is), Elle and Il deal with being apart while in love without the ease and speed of today’s communication methods. They wait, hope, and long to hear from each other. They think about what they write down on paper, in ink — especially when using those blue 22 cent aerogrammes. They read between the lines. They (at least, Elle) analyze. They pour their hearts out to each other. Their letters are private. They do talk on the telephone occasionally: when drama arises, and on Christmas, of course. But their letters continue. Today, most of us don’t write letters like theirs. We still send cards (though I believe that’s declining) and sometimes we write “formal” handwritten notes. When we write on a device or a computer, do we write differently? I think we do. When responding to an email, we may still read between the lines, but we almost have TMI — we even know the time it was written. We know our messages can be forwarded and shared and therefore, public. We are careful in what we say as a result. Remember the letter that Elizabeth receives from Mr. Darcy in Pride and Prejudice, the one that he hand-delivers? Maybe the methods lovers use to express themselves in writing have changed. But I’m not sure that what they say has. . .
* names will be revealed later this year when the novel is released.